FREMONT STREET EXPERIENCE HOSTS OKTOBERFRIGHTFEST: Fremont Street Experience transforms again for the Seventh Annual OktoberFrightFest combining Oktoberfest and Halloween for the ultimate street party. The spooktacular nightly fun kicks off Oct. 4 and continues through Halloween, Saturday, Oct. 31. Festivities include free performances of the live musical “Frank & The Steins” show, the Sixth Annual Fall Beer Festival at Golden Nugget on Oct. 9 and 10, and Halloween-themed Viva Vision shows set to musical favorites such as “Thriller” and “Monster Mash” after the regular 7, 8 and 10 p.m. viewings.“Frank & The Steins” will play on the 1st Street Stage Oct. 4–Nov. 1 from 8–11 p.m. nightly except Mondays and Tuesday, Oct. 20. On Saturday, Oct. 31 it will be performed from 7 p.m.–midnight. The Oktoberfest Pool Party at The Tank is Friday, Oct. 9 from 8–10 p.m. Admission is free. On Saturday, Oct. 10 from 7–10 p.m. is the Craft Beer Grand Tasting in the Grand Event Center with tastings of 125 craft beers, chef-inspired appetizers, entertainment and mingling. Tickets are $45 in advance. For $10 more, you can purchase the Oktoberfest Combo Package to get a $20 Food and Beverage credit for the Oct. 9 Pool Party plus admission into the Oct. 10 Grand Tasting. Five dollars for each Craft Beer Grand Tasting entry will be donated to The Animal Foundation of Las Vegas. FOOD TOURS OF AMERICA ARRIVES IN LAS VEGAS: With success in Dallas, Food Tours of America has expanded to Las Vegas. 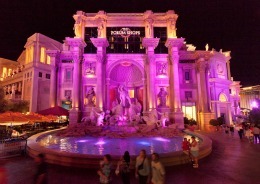 Chocolate lovers can indulge in a new tour dedicated to all things dark, milk and semi-sweet when Food Tours of America starts on Monday, Oct. 5 with the Vegas Celebrity Chocolate Walk available daily with one tour at 3 p.m. Advance tickets are required and can be purchased online at www.foodtourslv.com. Within the upcoming months, Food Tours of America-Las Vegas will launch additional tours including Vegas Celebrity Dine, Vegas Celebrity Eats and Vegas Celebrity Bites. All tours will focus on Las Vegas’ variety of popular restaurants, feature numerous points of interest and offer photo opportunities. In addition, Food Tours of America offers private group and customized tours. 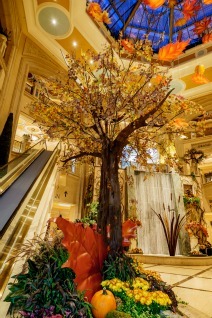 AUTUMN DISPLAYED AT PALAZZO® WATERFALL ATRIUM AND GARDENS: The Palazzo’s current seasonal display took six months to plan and fabricate by the resort’s floral and horticulture teams. The main feature is 16-foot-tall cattail sculptures crafted out of 70 percent recycled steel. The display also features a total of 8,000 pounds of pumpkins, with the largest pumpkin weighing in at 930 pounds. The flowers and plants of the display are refreshed biweekly. A team of five gardeners each spend four hours a day maintaining the gardens. This display runs through Nov. 16. HENDERSON HOLDS INAUGURAL OKTOBERFEST ON TAP: The first Henderson Oktoberfest will be held Saturday, Oct. 24 from 4-8 p.m. at the Henderson Events Plaza on Water St. for people 21 and older. Beer aficionados will toast the German heritage with several beer tastings, traditional German cuisine, dancers, games and concerts. 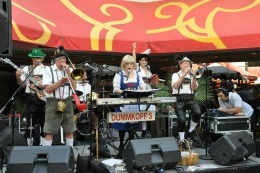 The Dummkopfs will perform at 4:30 p.m. and Oompoporama, with comedic artist Herr Dada, play at 5:45 and 7 p.m. Both bands perform traditional polka music, German songs and mainstream hits. Advance tickets are $10 and day-of-event $15. Admission includes a commemorative mug and one complimentary beer. DOWNTOWN SUMMERLIN HOSTS FREE SUMMERLIN FESTIVAL OF ARTS: Summerlin Festival of Arts is an established outdoor art event with more than 100 celebrated fine artists and crafts people displaying a variety of fine art for purchase along with music, food and entertainment. The event’s new location will be a grassy area in Downtown Summerlin’s open-air fashion, dining and entertainment venue. Children’s Activities will be hosted by Discovery Children’s Museum. The festival will be held Oct.10 and 11 from 10 a.m. to 5 p.m.
‘LEGENDS IN CONCERT’ SALUTES THE MILITARY: “Legends in Concert,” Las Vegas’ longest-running live tribute show for more than three decades, will honor the military on Veterans Day by offering a complimentary ticket to those with a valid military ID for the 9:30 p.m. performance at the Flamingo on Wednesday, Nov. 11. The current cast features tribute artists Elizabeth Scarborough Taylor Swift, Brian Duprey as Frank Sinatra, Coty Alexander as Madonna, and Jay Dupuis as Elvis Presley. In addition, “Legends in Concert” also offers a buy-one, get-one free ticket special throughout the year for anyone with a valid military ID. MIRACLE MILE SHOPS HOSTS SHOPTOBERFEST BEER FESTIVAL: Miracle Mile Shops is hosting Shoptoberfest, an indoor beer festival combining food, drink and shopping specials every Friday and Saturday in October. Starting at 10 a.m. each day, guests may purchase a $5 souvenir beer mug and wristband from Blondies Sports Bar & Grill. Patrons may then fill up their mug at participating mall restaurants for $2 while enjoying $5 food specials. Additionally, Shoptoberfest guests will receive 20 percent off specials at participating retail stores. For information, visit www.miraclemileshopslv.com/shoptoberfest. A bonus for those who spend $250 or more at the shopping center in a single day is they may take their receipts to Miracle Mile Shops’ customer service desk and redeem a $25 gift card towards a future purchase. Customers must redeem this offer on the same-day as their purchases, and each guest may only redeem one $25 gift card per day. HARD ROCK CAFE CELEBRATES 25 YEARS IN LAS VEGAS: Hard Rock Cafe Las Vegas at Hard Rock Hotel is commemorating 25 years in Las Vegas with a 10-day celebration Oct. 2-11. Festivities include free live music shows, throwback menu products, drink and food special offers, interactive occasions and more. BRAVO! 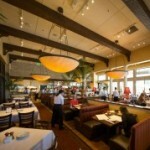 CUCINA ITALIANA STARTS DAILY SPECIALS UNTIL DEC. 1: BRAVO! Cucina Italiana at the Galleria at Sunset mall that opened in May has started its first holiday season with pasta, happy hour, all-you-can-eat and lunch specials being featured daily through Dec. 1. Monday is buy one pasta-get one free; Tuesday dinner for two $29.95; Wednesday all-you-can-eat spaghetti with marinara or meat sauce for $9.95; Thursday 50 percent off wine by the glass; Friday $7.95 lunch dishes in the bar; plus Saturday and Sunday all-day happy hour at the bar. JCC OF SOUTHERN NEVADA PRESENTS VARIETY SHOW ‘VIVA OY VEGAS! : The Jewish Community Center (JCC) of Southern Nevada will present “Viva Oy Vegas!,” a variety show featuring local Jewish talent including singers, dancers, comedians, etc., on Oct. 17 at 8 p.m. and Oct. 18 at 2 p.m. at the Baobab Theater in Town Square by the Yard House. Tickets at the door are $35 and $25 for JCC members. Some the Las Vegas performers being featured include Joy Demain, Elizabeth Bricker, Lou Magelowitz, Renée Hale and Jay Joseph. To make it easy for parents to attend Saturday’s opening night Oct. 17 the Jewish Community Center is offering Viva Oy Vegas!-themed kid programs at both the east side Midbar Kodesh Temple and west JCC sides of town, call 702-794-0090. ARTIST TATSUO MIYAJIMA’S U.S. DEBUT IS ‘HOTO’ ART INSTALLATION: Influential Japanese artist, Tatsuo Miyajima, debuted his 2008 work “HOTO” in the United States for the first time for an indefinite engagement at The Shops at Crystals. Previously the piece has been on display only in Japan and China. Inspired by Buddhist scripture, HOTO – meaning “treasure pagoda” – refers to a story about a monumental bejeweled tower that emerges from the ground, floats midair and covers half the world, symbolizing the importance of every human life. HOTO is a mirrored pagoda 18 feet high and more than six feet around, inlaid with 3,827 vibrantly colored LED numerical displays in varying sizes. The LED displays flash numbers nine through one in a descending, continuous series and at varying speeds, representing the never-ending cycle of life, the universal language of numbers and how every life moves at its own unique pace.Focusing on interaction rather than exhibition, the circular tower features angled surfaces that play with the viewer’s reflection, allowing them to visually locate themselves in the art. ATOMIC TESTING MUSEUM WILL HOLD FIRST ATOMIC VETERANS REUNION: Although the veterans often meet in small private groups, this will be the first national reunion of all atomic veterans. The three-day event Oct. 24-26 will feature casual conversations with groups of veterans who have witnessed amazing history and milestones of scientific achievement. Al Tseu, for instance, parachuted into an area of the test site following an atomic bomb test. Tseu will be one of the featured speakers. The museum staff will conduct oral histories throughout the event. The event will start at noon on Saturday and include a cocktail reception Saturday evening. Conversations will be featured each day and on Sunday and Monday museum tours for veterans and their guests will be offered. Cost is $50 for all three days; $20 for one day; $30 for reception; and $10 for a museum tour. 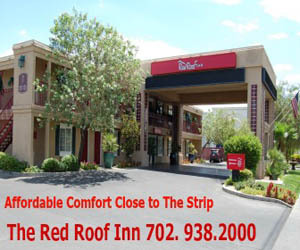 For more information or a reservation call 702-794-5151. DOWNTOWN GRAND REVEALS NEW CASINO ELECTRONIC TABLE GAMES: Downtown Grand has added new electronic table games on the casino floor. Tablemaster Fusion brings titles such as Three Card Poker, Ultimate Texas Hold ‘Em, Best The Set “21” and Royal Match 21. The game boasts a large HD display and graphics, 22” player touch-screens and five attractive video dealers to entice players. The SHFL Fusion is an automated Roulette game that comes with 22” player touch-screens, countdown timer for spin cycles and camera displays of live ball drop with superior visibility. QUICK TIPS: Legendary guitarist Tracii Guns who founded L.A. Guns in 1983 will return to “Raiding the Rock Vault” at the New Tropicana Oct. 7-12 and Oct. 23-Nov. 16. He was part of the show’s original lineup when it debuted in 2013 and since then has gone on to form bands including Devil City Angels and GUNZO. 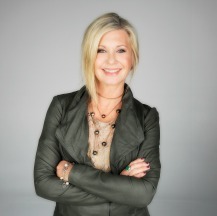 Nevada Ballet Theatre (NBT) announced headliner Olivia Newton-John will be its Woman of the Year for the 32nd Annual Black & White Ball being held on Saturday, Jan. 23, 2016, at Wynn Las Vegas. This event is the 44 year-old ballet company’s largest annual fundraiser. Emmy nominated Lon Bronson will return to Cabaret Jazz at The Smith Center with his horn infused 14-piece All-Star Band and celebrate the group’s 25th anniversary on Saturday, Oct. 17 at 7 p.m. with many guest appearances. The Gateway Arts Foundation will present “The Music Never Stops” at the Italian American Club on East Sahara on Sunday, Oct. 18 at 3 p.m. The show will feature singers Marianne Phoenix, Jeneane Marie and special guest Victor Moea. Cost is $20 at the door. Little River Band was named musical artist of the year and Ron White won comedian of the year. Charo presented Jerry Lewis who first performed in Vegas showrooms in the early 1950s with the Casino Entertainment Legend award. The NBA’s pre-season game between the LA Lakers vs. Sacramento Kings will be held at the MGM Grand Arena on Tuesday, Oct. 13. Tickets range from $25 to $500. Triple George Grill downtown received the TripAdvisor Certificate of Excellence Award. Now in its fifth year, the award celebrates excellence in hospitality and is given only to establishments that consistently achieve great traveler reviews on TripAdvisor. Recognized for its power lunch specials, happy hour offerings and classic cuisine, Triple George Grill celebrated its 10th anniversary in July 2015. BRIO at Tivoli Village is holding its “The Art of Pasta” promotion through Oct. 20 in recognition of National Pasta Month. The special offers a prix fixe, three-course menu for $19.95 that includes salad, pasta and dessert. The Culinary Excellence Awards will be held at The Palazzo Banquet Hall formerly known as Dos Caminos on Thursday, Oct. 15 from 6-10 p.m. For information email and tickets, email sayache@nvrestaurants.com or visit www.nvrestaurants.com. Each month, chef and owner Patricio Sandoval invites a different chef to “think outside the tortilla” and create a taco to be served in all Mercadito restaurants with a portion of proceeds going to Share Our Strength. This month, Chef Alex Stratta of Tapas by Alex Stratta, brings a Spanish and Mexican influences to Mercadito at Red Rock Resort with a Charred Octopus Taco during dinner for $4 per taco (minimum two per order). The book launch of “Save Queen Green! Mother Nature’s Eco-Rhymes” will be held at The District at Green Valley Ranch throughout the promenade on Saturday, Oct. 17 from noon to 3 p.m. with food samplings, a kid-friendly DJ, giveaways, contests and more. The book and album for “Save Queen Green” teaches children about the environment. PINK ACTIVITIES FOR BREAST CANCER AWARENESS: Miracle Mile Shops at Planet Hollywood is pink this October in support of Breast Cancer Awareness Month. The fountain display is a pink hue through Oct. 31 and all change tossed in will benefit Southern Nevada Affiliate of Susan G. Komen®. Throughout the month, The Forum Shops is selling its popular Style Pass that features more than 50 exclusive offers and valuable discounts for $5 with donations going to support the fight against breast cancer. The Southern Highlands Charitable Foundation, in partnership with MJ Christensen Diamonds and Pacific Links International will present the 11th Annual Ladies’ Pink Tee On Thursday, Oct. 29 at the Southern Highlands Golf Club. NEW GRAND CANYON WEST AIR TOUR LAUNCHED: Papillon Group’s Grand Canyon Scenic Airlines is launching the new Grand Canyon West air tour, Native Explorer Tour with Legacy. This air tour departs from the Grand Canyon West air terminal. After returning to the terminal, the West Rim adventure continues aboard an air-conditioned motorcoach for a self-guided ground tour of Grand Canyon West. The first stop is the Hualapai Ranch, where cowboys reenact the Old West gunfights. The next stops are Eagle Point and Guano Point. Pricing begins at $140 per adult and $120 per child. WESTCARE HOLDS ‘HAUNTED HALLOWEEN HAUL DRIVE’: WestCare Nevada has teamed with community partner ATI Physical Therapy (formerly Matt Smith Physical Therapy) for a Haunted Halloween Haul Drive, which will benefit the women and children at the nonprofit’s Women and Children’s Campus. The drive asks for donations of new toys, blankets and clothing, new toiletries, Halloween costumes and unopened bags of candy through Oct. 28. Items can be dropped off at donation boxes located inside any 15 of the valley’s ATI Physical Therapy Locations.